The team wanted to take a moment to say a huge congratulations to all those who have successfully achieved an award from the programme this year. There are 28 people in total who will be awarded Certificates, Diplomas or MScs in November 2012, and we couldn’t be more delighted for all of you. We know the challenges and triumphs that many of you have encountered along the way, and you should all be extremely proud of yourselves for what you’ve achieved. 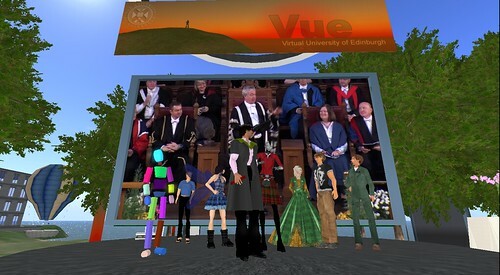 We’d like to invite everyone – current students, graduates, alumni, families and friends – to join us for our annual Virtual Graduation ceremony in Second Life. The event will be held on Thursday 29 November at 11am. Some of the graduates will be there to graduate virtually, and we will also watch the live ceremony streamed from McEwan Hall in Edinburgh and cheer on those who are attending the face-to-face ceremony. It’s always a wonderful event, as you can see from the past years’ photos and information . It would be great to have you with us, so please do put it in your diaries! More details to follow in the next couple of weeks.